Since the new Tool album is expected to be released in 2014, drummer Danny Carey at least announces himself with a musical sign of life - and what a sign! His quartet Volto! unites first-class musicians from L. A., who gave free rein to their love of seventies fusion à la Jeff Beck and Weather Report in a small jazz club. A CD recording was ultimately only a matter of time, and the fact that the nine tracks were recorded live undoubtedly underlines the qualities of the band around guitarist John "Volto" Ziegler, bassist Lance Morrison (Alanis Morissette) and keyboarder Jeff Babko (Larry Carlton). 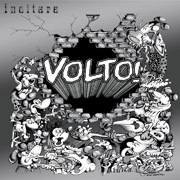 The title "Incitare" is to be understood literally, because Volto! is constantly driving itself to top performance. John Ziegler, who is completely unknown to us, is the discovery of this CD, as he sets the direction with juicy leads, lusty riffs and playful frills. Remarkable is also Danny Carey, who performs great drum grooves and knows how to inspire with his solos about ostinato figures. Volto bene!